Firstly, may I wish a happy and healthy New Year to you and all your loved ones. I do hope that you have all had a wonderful and happy time with your families over the Festive Season. Following the festivities, we had a quiet few days ahead of us, with time to reflect upon our Christmas spent with our family and our New Year celebrations with friends and family. On Friday 4 January, I took the opportunity to visit a very old friend James Victor Pearson who is not at all well but was that day, celebrating his 50 years as a Freemason. Sadly, he was not well enough to venture to his lodge for a celebration, but I was accompanied by the Lancaster Group Chairman Neil McGill on our short but very enjoyable visit to see Jim and offer our congratulations on his achievement. 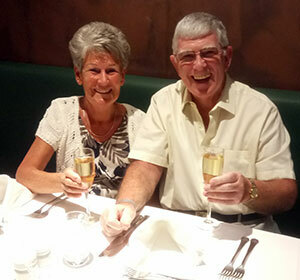 Maureen and I sampling some of the excellent food and wine of Cape Verde. On the Sunday, Maureen and I were off to Manchester Airport early in the morning for our flight to Sal, Cape Verde for a holiday in the sun. After a long flight we arrived at the hotel for the start of our two weeks rest and relaxation. Sun, sea, food and drink and there was plenty of everything. We had a wonderful, relaxing time under the palm trees enjoying the brilliant sunshine and sipping gin and tonic! The food was excellent; so much fresh and delicious fish and every other type of food you could wish for. Well, ‘bang’ went the diet., but the champagne and lobster were definitely worth it! Sadly, all good things must come to an end and it was time to fly back home on 21 January and return to the cold and wet UK. Wednesday 23 January saw me back at the Provincial office for a meeting with Peter Taylor and Phil Gunning. Great to be back. Later in the day I attended my lodge, Poulton le Sands at Morecambe, for the January meeting. 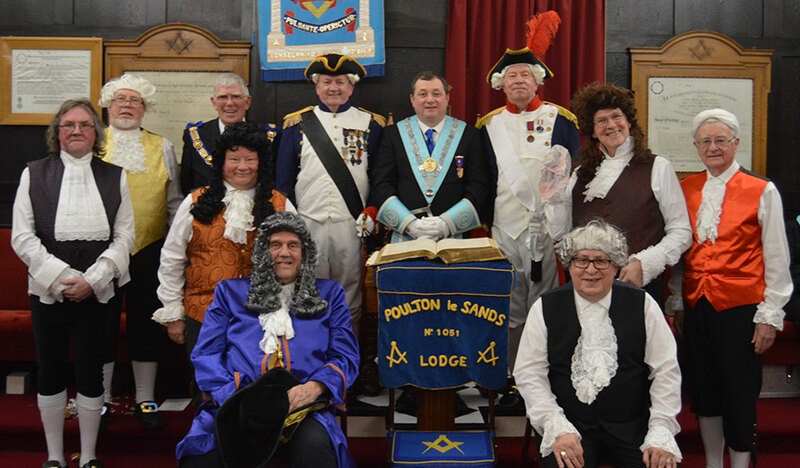 We had a very short business meeting which was followed by a presentation of the ‘Timeline Drama and Pageant’ presented by players from the St. Helens and Prescot Masonic Group. What a performance they gave. I was amazed to learn that the concept for the performance first took ‘root’ in 2014. The ‘players’ have now given 26 performances to more than 1,500 people and travelled well over 1,000 miles around our Province. It was excellent and for those brethren who have already witnessed this pageant, they will be very much aware that it is very life-like of UGLE. What a wonderful event to start the 2019 year. You can read more about their visit by following this link. The marvellous ‘Timeline Drama and Pageant Team’ from the St Helens and Prescot Group at Poulton le Sands Lodge. On the Friday evening I went to my Rose Croix chapter meeting at Morecambe where we were working a Perfection ceremony and conducting the business meeting. The next day, after a leisurely morning, Maureen and I, together with several other friends, set forth for Hope Street Liverpool where we enjoyed a social evening in the company of many brethren and their ladies. On the final day of the month, I drove in the morning to Leyland, for a meeting at the Provincial office. This was followed by the installation meeting of the St. Malaise Council No 112 of Knight Masons, which meets at Wellington Park and of which I was the first chief of the Council. A very good meeting indeed which was enjoyed by all present. That brought the month to a close and I look forward to February when my Masonic duties commence in earnest.